Twin Stuff! Newsletter -- Twin Proofing Your House -- Daily Twin Log -- It's a Twin Thing! So, you've made it through the pregnancy, survived the early months, what's next? 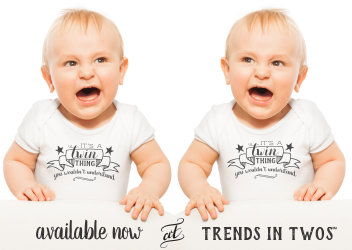 Before you know it your twins will be toddling around and into EVERYTHING! Yes, parents of twins have a bit more to worry about when it comes to child safety in the home. Okay new twin mamas, we have what you have been waiting for...An instant download of our Double Duty Daily Log Sheet for Twins. And it's only a mere sanity saving $.99 cents! Then you can save it to your computer and print out as many pages as you need. 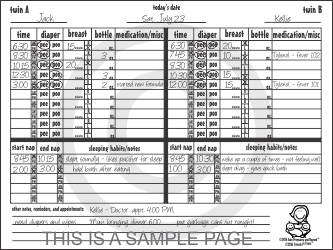 Each page allows you to keep track of BOTH babies with all of the most pertinent information on a daily basis. The log sheet is exactly like the ones in our Coil bound, 90 day, Double Duty Log Book (which is also available for purchase if that's what you prefer). Of course we had to show off the newest design from our sister-site, Trends In Twos™! You will love this totally hip print available on baby tees, one-pieces, toddler shirts and more! Because come on, it's a TWIN thing, you wouldn't understand...Unless you're a parent of twins, that is! Just click on the two hipsters above to shop! 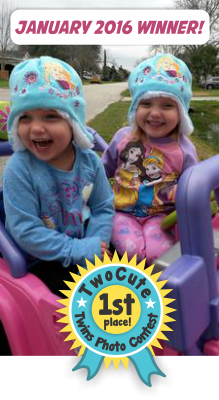 These twin sisters are just having so much fun we feel like we are laughing with them! We just love seeing all of your entries every month...It's always hard to choose a winner with so many adorable twins out there. Keep up the good work parents!